Jo-Anne McArthur is a true badass. If I didn’t have generalized anxiety, a love of personal comfort, or the nickname “Safety Sam,” I’d dream of being her. If you ever have the honor of meeting her, your first impulse might be to give her a high-five or buy her a drink. I’m sure she’d welcome one or both. But I’d also suggest that you give her a hug. Jo-Anne bears witness to so much suffering in the hopes that the rest of us might better understand the violence and inhumanity inflicted on living, sentient creatures. Animals are used for food, clothing, research, experimentation, work, entertainment, slavery and companionship. In so many cases, people are unaware of the abuses the animals in these industries face. I know very smart people who assume that cows always have milk and it's a relief for them when we come to milk them. Unfortunately, this isn't the case. Issues ranging from forced impregnation, male calves being sent away for veal, and cows' maternal bonds breaking due to the immediate loss of their children (who would otherwise drink the milk the industry's based on), are all forgotten consequences. Similar issues arise for animals in other industries, the clothing industry being just one of them. Perhaps if we knew the true price, we’d choose to do without. "I think it was a perfect storm. My love for photography and composition, and creating art. My long-standing desire to volunteer and help in the world, rather than being a more passive member of society, and, of course, my love and concern for animals. The camera really satisfies an itch for us photojournalists; it’s like an all-access pass into the lives of others. We can uncover things and tell stories. And I realized, about fifteen years ago now, that there were many very important untold stories, and they were the stories of the animals we keep hidden. Billions of them, behind factory farmed walls, in fur farms, in research labs. These animals are virtually invisible in our world. I realized my camera could be a powerful weapon for change, and that’s how I strive to use it." We were honored to interview Jo-Anne McArthur about the place of animals in the clothing industry, and learn more about places like fur farms and the animals that are suffering because of them. Jo-Anne also talks to us about her passion - photography - and how we can use our own passions and skills to make a small difference in the lives of so many animals in need. WHAT ANIMALS ARE USED IN THE CLOTHING INDUSTRY THAT WE MAY BE UNAWARE OF? All manner of foxes, mink, raccoon dogs, rabbits, chinchilla, sheep, goats, ducks, geese, alpacas, cows, crocodiles and alligators, snakes…it’s incredible, isn’t it? All these animals that we don’t need to use but we do. Geese and ducks are live-plucked for their soft down feathers. Alligators are factory farmed in the US and other countries for their skins. Cows used for leather, sheep for wool. It’s all unnecessary. 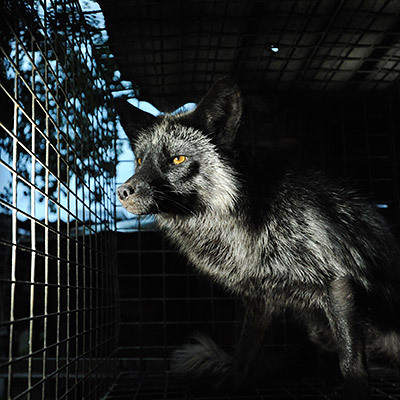 CAN YOU EXPLAIN WHAT FUR FARMS ARE AND HOW THEY OPERATE? 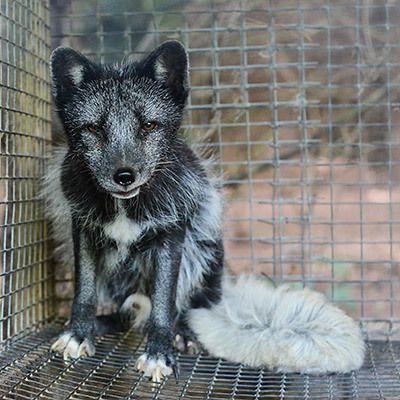 Fur farms, like farms that breed and cage “food” animals, are meant to wring maximum profit out of each individual. That means extreme confinement so that the farm can fit a maximum number of animals inside. Mink farms are very long narrow barns or sheds with small cages lined at waist height. They are given food once a day, by machine, which runs down the middle of the barn. It’s all very efficient these days. The animals are bred, they give birth, the kits or cubs grow until they are taken away and gassed or electrocuted. Due to the stress of confinement, the animals are highly stressed and so fights, injuries and cannibalism are common. Foxes and raccoon dogs live in larger cages than mink but they are equally depressing. One of the really sad things about fur farms is that the animals can see the outdoors, their rightful home, right there on the other side of the cage they’re in. It’s like this especially with the fox farms. They just sit there, or pace or circle there, on mesh floor, looking at the inaccessible freedom surrounding them. 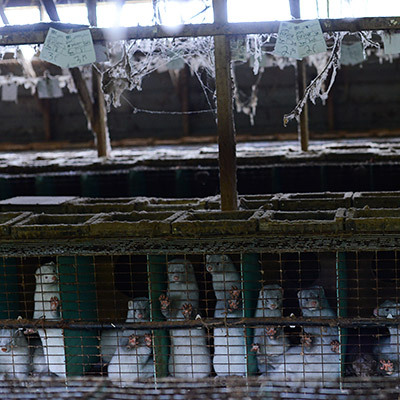 WHAT ARE THE LIVING CONDITIONS LIKE FOR ANIMALS IN THESE FARMS? I’ve met hundreds of thousands of mink, fox and raccoon dogs on fur farms at this point. Sometimes I spend 5 or 6 hours documenting the conditions, the injuries, the confinement. What you’re faced with in these places are thousands of wild animals kept in completely unnatural circumstances. Deprived of any ability to exercise natural behaviors like digging, roaming, swimming, hunting, mating and bonding with others, the animals develop stereotypical behaviors, such as the pacing, circling, bar-biting, self-mutilation and infanticide. A certain number of the animals are expected to die before being killed for their fur; it’s just part of the numbers game and how the industry works. WHAT DO YOU FIND TO BE MOST UPSETTING UPON VISITING THESE FUR FARMS? I find two things most upsetting. The moms. The mink mothers are really upsetting. When their kits are very young, the moms are extremely defensive and protective, and so we work quickly so as to disturb them as little as possible. But their bravery just wrecks me, because *I know* their fate. No matter how brave and loving they are, nothing is going to stop the farm from taking and killing their babies. And these breeder mink go through it over and over, just like many females whose bodies we use for reproduction so that we can kill and eat their young. This is how pigs and cows are used as well. The second most upsetting thing is seeing the despondency in the animals. Those who lie motionless, who have just given up. 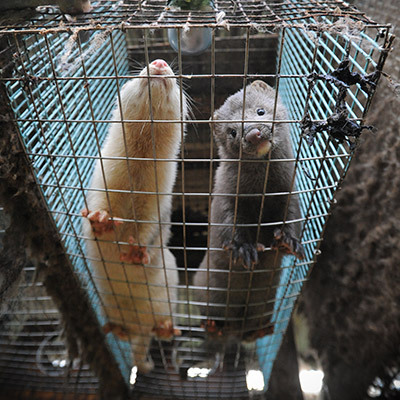 Fur farms are places of mass cruelty and killing, to satisfy an unnecessary human luxury. And yet most of us buy fur so innocently, without a thought and with no awareness of the cruelty behind the “product”. WHY DO YOU BELIEVE IT’S IMPORTANT FOR US TO SEE THE TRUTH ABOUT HOW ANIMALS ARE TREATED THROUGH YOUR PHOTOGRAPHY? I think a lot of my images are hard to look at for two reasons. I do believe that we’re all innately compassionate, and it therefore hurts to see the images from We Animals, which are largely images of animal suffering due to the situations we’ve put them in. But it’s doubly hard to look because to see their suffering, to see the cages and confinement and brutality, is to see our complicity in that suffering. Sometimes seeing is the first step in learning and understanding, which goes back to the question about why images are so crucial. We can talk and write about animal suffering, but then seeing a pig in filth and despair in a gestation crate hits you like a ton of bricks. I love the quote by Dr. Jane Goodall, which is “Only if we understand will we care, and only if we care will we help”. And so I try to show what is hidden, so that we can see, understand, care, and help. And it works. Slowly. One person at a time. WHAT CAN YOU SAY ABOUT CULTURAL DIFFERENCES AND THE IMPACT THEY HAVE ON OUR USE OF ANIMALS IN THE FOOD, CLOTHING AND ENTERTAINMENT INDUSTRIES? The short answer is that there is mass use and abuse of animals in all countries. In the US, we see the confinement of billions of animals because, simply put, we eat and consume them in large and unnecessary quantities. Improvements in welfare and animal protection laws are being made in some countries, but everything is slow-going, and enforcement of new regulations is lacking anyway. We need a collective shift in thinking about animal use. We need to realize that we’re consuming individuals, not “meat”, that we’re wearing foxes and mink who had families, not just “fur”, and so on. And we need to understand that, in treating animals this way, we’re wrecking the environment and our home. And their home. There are a lot of behaviors that we don’t need to take part in, and they are surprisingly easy to change. 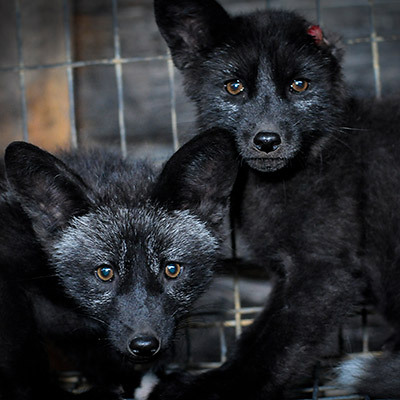 For one, everyone who reads this article could commit to never buying or wearing fur. If there’s no demand for these products, subsidies will only go so far and then we can see an end to fur farming. And THAT will put an end to the unnecessary suffering of millions upon millions of individuals. What ways can the every-day person make a difference for animals in the industry? Luckily, there are so many ways to make the world a better place for animals. First of all, we can stop eating them. No, really. It’s doable, and it’s actually quite joyful! I remember, long ago, thinking that not eating animals was extreme. Oh man! I’ve come to realize that incarcerating and killing billions of animals each year is what’s extreme. We can consume less of everything. And we can consume differently. There are seven billion humans on this planet and we are eating everything, using all the resources, taking all the inhabitable space. Making daily decisions to curb out consumerism has a positive effect on humans, on animal and on the planet. We can choose to buy cruelty-free, animal-free clothes, and in the US, there are more options than ever. We can differentiate between what we need, and what we want. We don’t need fur. The animals do. But we don’t. I’ve learned that it’s not a sacrifice, but a joy, to make the more compassionate choice. Photo Credit: Jo-Anne McArthur and The Ghosts in Our Machine. Saving elephants one kid at a time.